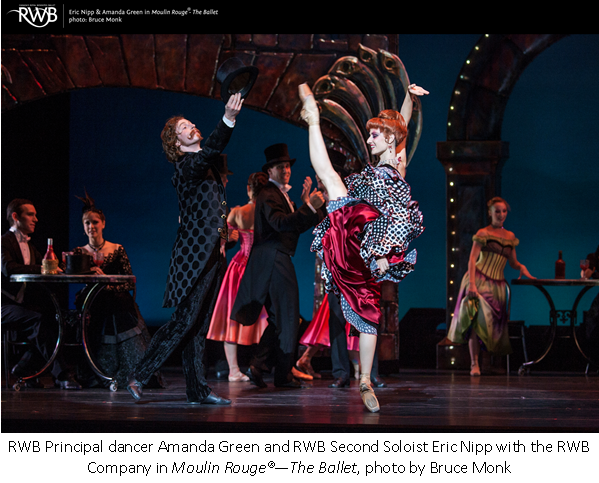 Canada’s Royal Winnipeg Ballet (RWB), is based in Winnipeg, Manitoba, Canada. Founded in 1939 as a club, almost two decades later, the Company received a Royal charter (by Queen Elizabeth II) to become the first Royal ballet company in the British Commonwealth. In 1954 the company toured to the U.S. and today, spends anywhere from five to 20 weeks a year on the road. The Company has toured to South America, Europe, the Middle East, Russia, Japan, Asia, and Mexico as well as every Canadian province. How does the educational program at the Royal Winnipeg Ballet promote diversity and accessibility? 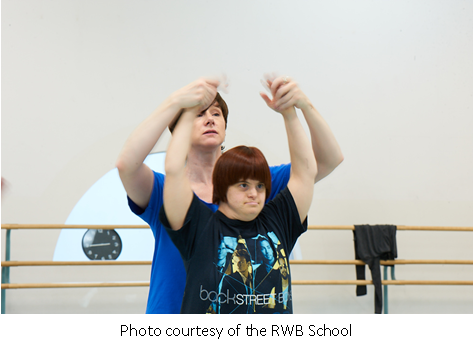 At the RWB School, we encourage students of all ages and skill levels to develop their love of dance. 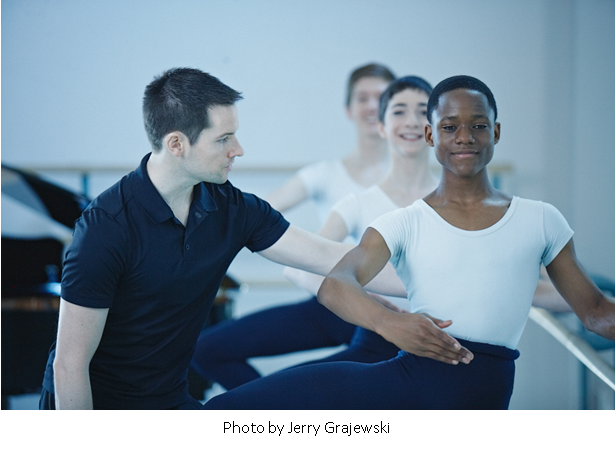 Students have the opportunity to begin studying dance at any age, and a wide variety of training programs help students grow and develop their connection to music and movement. With more than 1,200 students annually, the RWB School is the home to the Professional and Recreational Divisions. Internationally renowned for its exceptional teaching staff and commitment to artistic excellence, the RWB School inspires students to set and achieve their goals. The School’s proximity to the Royal Winnipeg Ballet Company allows us to offer students in both divisions unique performance opportunities alongside Company dancers. Within the RWB School’s Recreational Division, the ExplorAbility program is designed for adults with varied movement abilities. ExplorAbility participants are guided through a customized exploration of dance and self-expression. Through this guided study, which incorporates both group and individual exercises, participants explore many different styles of movement, patterning, and music in a fun and supportive environment. Wheelchairs, walkers, and other devices are welcome! Innovative. Throughout its history, a hallmark of RWB has been the production of bold, new creations. During his tenure as Artistic Director, André Lewis has worked to revitalize the Company’s repertoire by commissioning mixed repertoire works that continue to push creative boundaries, as well as full-length ballets such as Dracula, Moulin Rouge® – The Ballet, and most recently the genre crossing ballet The Handmaid’s Tale based on the novel by Margaret Atwood. The RWB achieves a fine balance between the classical traditions of Europe and the boldness of contemporary ballet, which in turn has given this diverse company a unique style. Nurturing. Not only does the RWB aim to inspire students of all ages, the organization also continually strives to nurture the skills and artistry of its talented Company dancers and the professional skills of all members of the organization. Throughout its history, the RWB has retained an exceptional number of talented individuals, some with careers that explore different facets of the organization and span over two decades. This expertise allows for the perpetuation of knowledge, the ability to gauge our current pursuits against our past successes and challenges, and provides the opportunity to mentor the builders of the future. Accessible. The RWB loves opportunities to share its love of dance with all members of the community, and to open its doors and teach people how ballet and dance in general can enrich their lives. Whether it is for the sake of fitness, community building, or providing fantastic cultural entertainment, there are a many ways in which RWB bring dance into the lives of others. What does it take to become a successful ballet company in this day and age? RWB’s Artistic Director, André Lewis cites versatility as the key element required for future growth. Our aim is to be receptive and in tune with the interests of our audiences, while presenting work that we feel is of strong artistic integrity. Describe 2 works that the company is currently rehearsing. What are the works about? How do they represent the company? The RWB is also currently rehearsing for Mixed Programme which runs in Winnipeg from May 7-11 at the Centennial Concert Hall. The mixed repertoire performance will feature William Forsythe’s The Vertiginous Thrill of Exactitude, James Kudelka’s The Four Seasons, and Jorden Morris’ Défilé. Mixed repertoire is a performance platform that historically put the RWB on the international map. The Company’s presentation of mixed repertoire garnered much audience and critical acclaim while the Company was in its infancy and it is a style of performance that still resonates with audiences today. In particular, Défilé is a piece that shows the scope of the Royal Winnipeg Ballet. 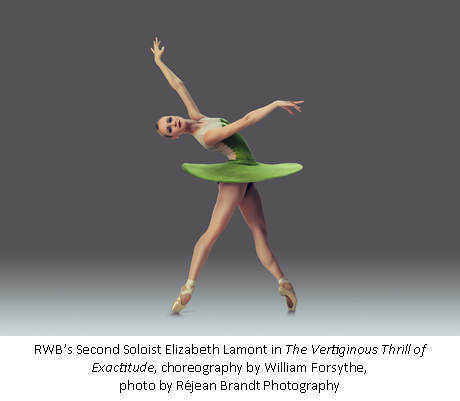 The piece incorporates some of the youngest students at the RWB School and the work shows the transition and growth of dancers as it moves through the higher levels of the School into the highest levels of the Company. It is a work that embraces life-long learning, showcases the development of a dancer, and maintains the mantra that a passion for dance lasts a lifetime.